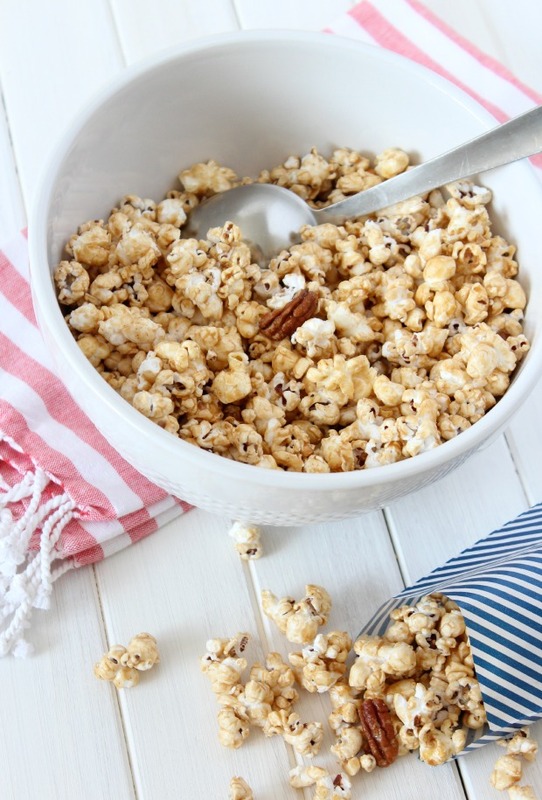 You’ve gotta try this tasty caramel popcorn recipe made with honey, cinnamon, nutmeg and pecans (and absolutely no corn syrup). A simple snack or dessert that’s perfect for parties! Most of the time, I eat my popcorn with a drizzle of butter and sprinkle of sea salt. No fancy toppings like salt & vinegar or dill pickle or whatever else they’ve managed to put in a shaker. You see, I’m trying to be more mindful about what I eat. Definitely not 100% clean, but I’m choosing better options to some of the foods that are deemed not-so-good. Take yummy caramel popcorn, for instance. It’s usually loaded with tons of sugar and corn syrup. Why does it have to taste so darn good? For the longest time, I avoided making it. Cause if I did, that little voice in my head would remind me around 3:00 p.m. that it was in the pantry. And that definitely wouldn’t help me cut back on refined sugar, now would it? Then I started playing around with the recipe. What if I took out the corn syrup, reduced the amount of brown sugar and used good quality honey instead? What if I added cinnamon to balance blood sugar and nuts for a bit of protein? What if I used my hot air popper to pop good quality popping corn? Perhaps not perfect on the health scale, but a much better option to the caramel popcorn recipe I was making before. And just as delicious… No, I’d say even more!!! In my opinion, better eating is all about moderation. Are you with me? 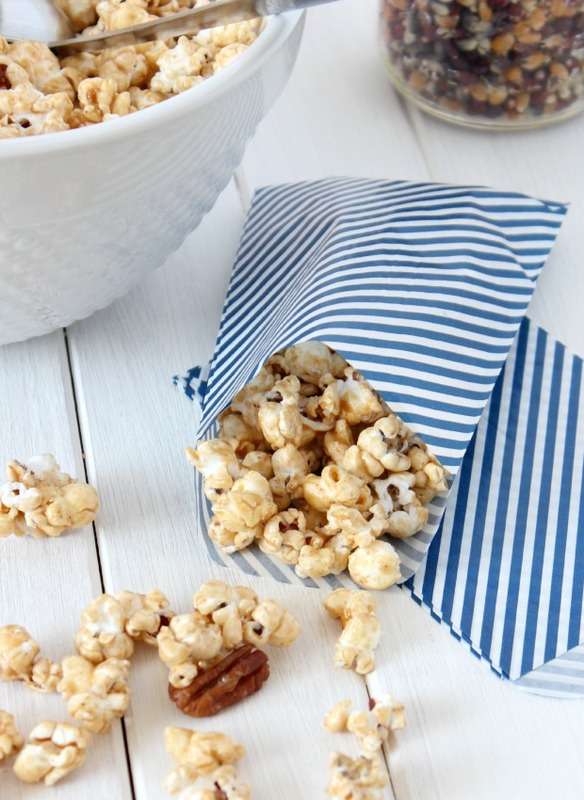 A caramel popcorn recipe made with honey, cinnamon, nutmeg and pecans. No corn syrup. Simple, delicious and perfect for parties! Prepare popcorn in an extra-large bowl (*metal if possible). Add pecans. Combine butter, honey, brown sugar and salt in a heavy saucepan. Heat and stir over medium heat until mixture comes to a boil. Turn down heat to low and boil without stirring for 3 minutes. Turn off heat and stir in cinnamon and nutmeg. Add vanilla. Remove from heat and stir in baking soda (mixture will expand). 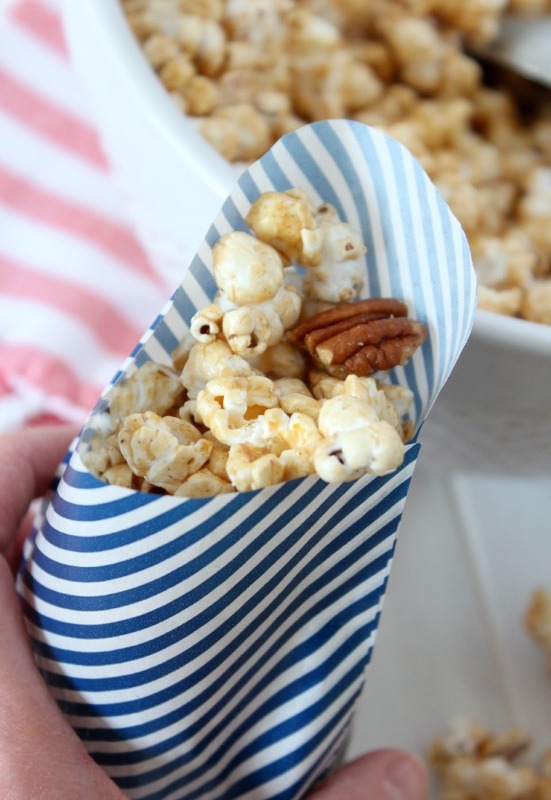 Pour over popcorn and toss together until popcorn and pecans are evenly coated. Spread on 2 large ungreased pans and bake for 45 minutes, stirring every 15 minutes and rotating pans. *As an option, prepare popcorn mixture in an extra-large metal bowl and there's no need to transfer to pans before baking. Remove popcorn from oven, stir and cool for 5 minutes. Break apart (if necessary) and allow to fully cool. Transfer to an air-tight container (if there's any left). Use the best quality ingredients possible. I recommend using a hot air popper (no pre-packaged microwave popcorn). Try different varieties of honey, such as wildflower or clover, to change up the flavor. Choose organic and non-GMO (if that's what you believe in). Makes a great party favour or snack too! Looking for another grab and go snack? 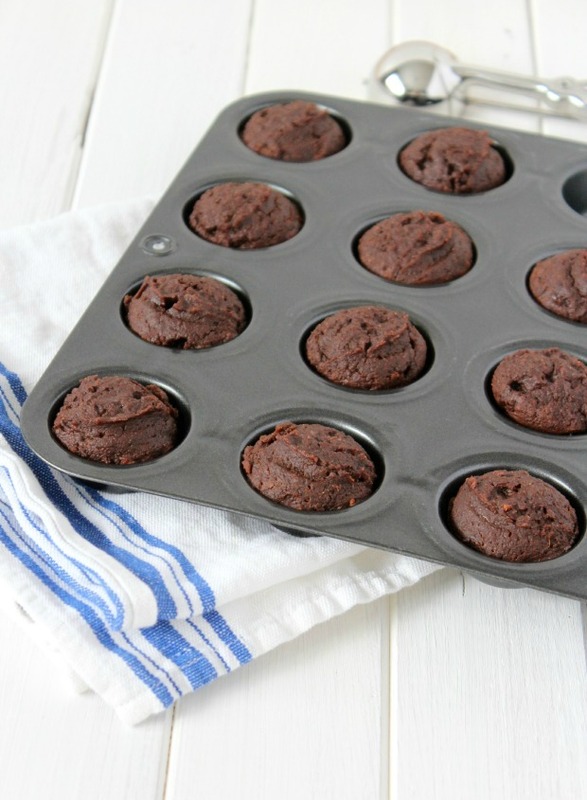 Check out my brownie bites made with healthy sweet potato. Oh that looks good Shauna! Popcorn is always my go-to feel-good snack but I’ve never messed with it. Looking at your photos I just might venture – that combination sounds great! I wasn’t sure about the cinnamon and nutmeg, but we love it. It just adds that little extra flavour like an old-fashioned doughnut! I am a popcorn NUT! This recipe was made for me, thanks for sharing! Hi Jen, thanks for stopping by. Let me know how it turns out! Sounds delicious, the only thing I have to say about your instructions: have you tried a microwave popcorn bowl? If you do you’ll fall in love! The reason I love the bowl better than the hot air popper is because not only is it a multi-tasker, as Alton Brown would say, but it puts a little moisture on the popcorn during the popping that lets the salt and other toppings stick better. This looks soo yummy! My kind of treat! 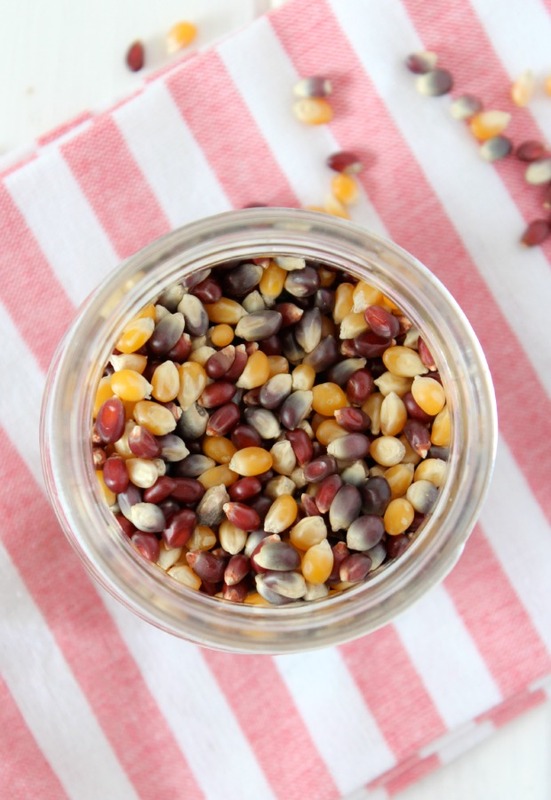 Did you make this recipe for me…because I seriously LOVE popcorn. When my husband says he’s going to Rona, I actually agree to go solely due to the fact I get to grab a little bag of that buttery goodness. This recipe though calls for celebrating….it sounds utterly divine!!!! This looks so yummy. Beautiful photography too. I have a serious problem with popcorn and this recipe is not going to help! Looks so good! !